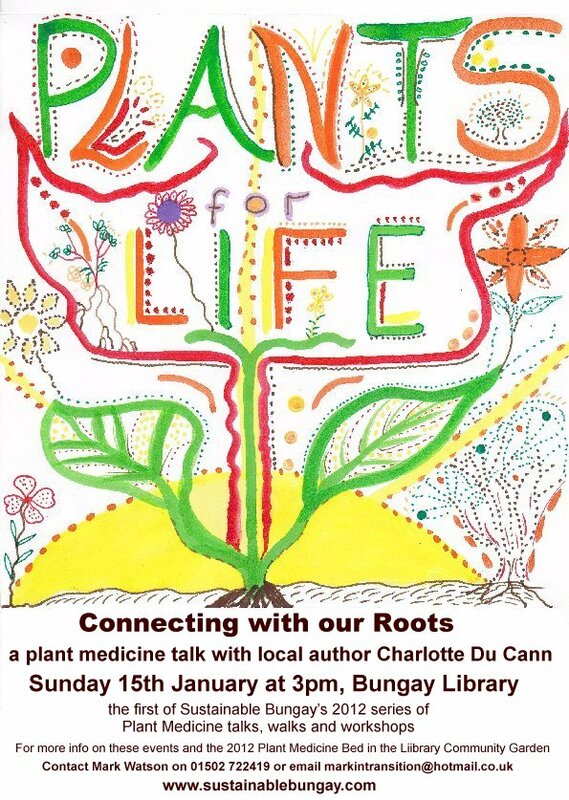 Here Charlotte Du Cann writes about giving the first Plants for Life talk at Bungay Library on 15 January. This post was first published on This Low Carbon Life, the Transition Norwich blog. Writing now it’s hard to recall exactly what I said in the 40 minutes that followed, because as you go about Standing Up to Speak you realise that set and setting are everything, the people in front of you are everything, and the words come tumbling out in a completely different order than you expect. I imagine I am going to give a neatly ordered talk, but plants and speaking are spontaneous right-hemisphere things. You write ideas and concepts in left-hemisphere lines in your blue notebook, and then you look at the audience and those words start inventing loops and connections you hadn’t thought of. You find yourself swinging far and wide from those linear concepts, running with a topic in directions you had no idea were there. You find yourself getting up and dancing and making people laugh. And you have to go with that. Because it’s not just you speaking and this is the initiating talk in the Plants for Life series Mark has organised for 2012. So in this post I am giving just a part of what I remember and letting it go where it wants to go.I wanted to start with a flower that was appearing in January and on our way to the Library we found a butterburr on the road to Brampton – a composite flower, known as winter heliotrope to gardeners, related to the native larger butterburr (known as petasites to herbalists). So that was the defining plant, a member of the sunflower family, frequently used as a natural pain killer and anti-allergen. I passed it around so everyone could smell its heavenly vanilla scent. How do you approach a flower? I asked the circle. Colour, scent, shape, touch, taste we all agreed. With our memory and imagination, poetry and song. How do you approach your day? Ah, that’s harder. We think about our day. We drive down the country road and we don’t see the flower standing there on a cold January day, clocking the pathway of the sun. We are on the one-way fast track, staring dead-ahead. When you stop you realise you have to slow down and look all around. Notice this earth we are on for such a short while, what time we are in. 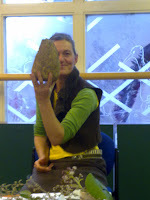 Right now we are in root time, coming up to emergence next month with the snowdrops and aconites. We’re still in winter, on the edge of hibernation, underneath the soil, in the dark, storing up our energies for the bursting out of spring. What are the root dishes on our table? Swede, parsnip, carrot, turnip, beetroot, potato, Jerusalem artichoke. What are the root tincture and teas on our medicine shelves? Angelica, burdock, elecampane, horseradish, liquorice. All herbs for resilience, the sweet, the bitter and the pungent. I held up a stringy root many people recognise (nettle), and a root most people don’t. Here we are I said, in root time in sugar beet country. In January the trucks of East Anglia thunder towards the sugar refineries of Cantley and Bury, ferrying these wurzels torn up from the muddy fields. They stand waiting in vast piles by the road. We don’t notice them as we speed by. We are barely aware the sugar that goes into our tea and marmalade comes from these pale giants, or anything about the industry that turns these roots into the white stuff that artificially sweetens our indoor lives. You can’t make these connections with your straight mind, you have to do it with your wiggly mind that runs along the lines of the rivers and clouds, along the shapes of shorelines and roots and branches. You have to use your imagination to see the invisible underground systems of plants and the connections all the mycorrhizal fungi make. Right now, in root time, you have to go into the depths of yourself and connect with the plans and maps and dreams for the future you hold in store, that will one day burst through into the light of day, come what may. Once you are rooted in time and space, in synch with the living systems, you can look at the bigger picture, you can be aware of your every encounter with all its ramifications. Where you don’t want to be in a time of unravelling is whirling about in your mind only thinking in straight lines, listening to the radio in the car, in air-conditioned 24/7 time. You need to make different connections. Approach the world with all your senses. Stop and look around. Get up out of your comfortable chair on a cold day. See things for yourself. It’s a wiggly world out there with its own beautiful sun-based logic. In this earth-bound time and space the terror that prevents us from seeing what is happening to the planet and ourselves can be evaluated and acted on. You have to use your heart to see like this and not hold on to a fixed world view, you have to get up and shimmy and let those stiff thoughts and habits break up and decrystallise, so you can think and feel about life in a different way, come up with new twists and solutions. There is one root we have in England that gleefully occupies every space and can give us all a hand in this endeavour: it was the main plant of the talk and is a peerless medicine for this crossover moment, from root time to emergence. Another member of the sunflower family, the Dandelion. This resilient “weed”, loved by bees, hated by gardeners, contains in its roots, leaves and flowers all the bitter qualities of heart medicine. It gives us minerals for our bones and helps break up the stiffness we inherit from living in a rigid and heartless society, striking the strange attitudes of snooty politicians and fashion models. Detoxes our system, cools our inflamed and creaky joints. We ended the afternoon with dandelion and burdock tea. Two of the most powerful and most common medicine roots in the realm. Free for the taking. This post can’t do the things that speaking can. Because it misses a vital ingredient. No matter how smart and entertaining the words, how lovely the images, the warmth and vibrancy of people and the physical world are what really matter. Without them we go nowhere. Without these meetings there is no material, no context for anything we write. Photos by Mark Watson and Elinor McDowall: poster for Mark’s Plants for Life talks, walks and workshops, 2012; CDC standing up to speak; tools of the trade; anyone know this root? 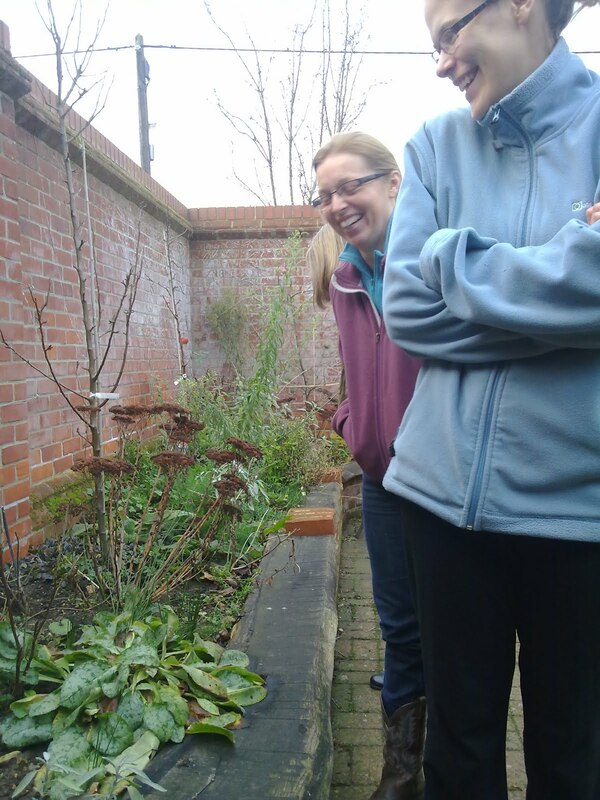 (sugar beet); dandelion clocks in real time; Gemma and Kate checking out resilient herbs; Nick, organizer of the Bungay Library Community Garden.